As the continuation on a series on Chinese Meal and Banquets (see last two blogs), I will be writing about a Chinese Banquet that my parents and their family were invited to by a good friend of my father while we were back in Kuala Lumpur for my parents’ Golden Anniversary. Since I missed partaking in these kinds of dinners and such quality of cooking is frequently amiss outside of Asia, I did not pass up on this opportunity when inquiries were made about who wanted to join this meal gathering. 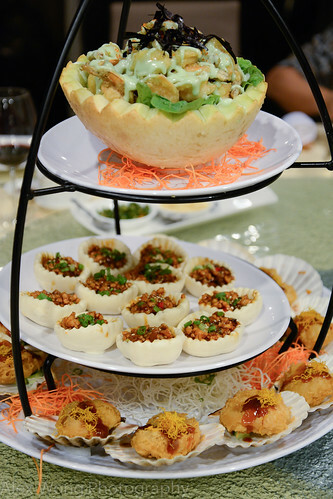 Since my Australian nephew, mentioned in the last blog, was in attendance, it was an opportunity for me to reinforce what he had learned about the sequence of dishes in a Chinese Banquet. 1) Appetizer: Three Seasons. Unlike my parents’ banquet, here we have a slightly abbreviated version of the usually served Four Season dish. 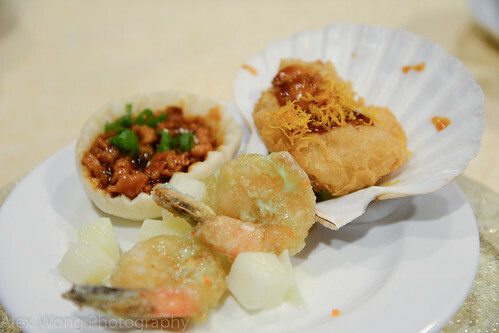 On this occasion, we were served Shrimp and Melon with Wasabi Sauce (a Japanese influence here), Panko-breaded Scallops with Sweet and Sour Sauce (again more Japanese influence), and Chicken and Chinese Mushroom in Steamed Bun Cup. Here we see the chef’s creative streak in infusing some Japanese ingredients and technique, and updating the traditional steamed bun by making it into a cup. This is a study of contrasts in flavors, ingredients, and textures, as most banquet first-courses showcase in their platters. 2) Soup: Lobster and Birds Nest Soup. As I mentioned in the last blog, usually Shark Fin Soup is served in banquets, but they have fallen out of favor with the current generation. 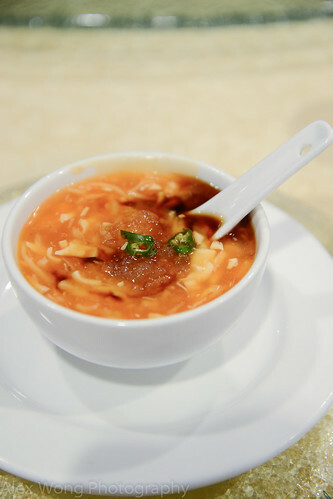 As an alternative, here we were served this luscious soup made with rich lobster meat and expensive birds nest that has the same texture as shark fin. Again, the addition of Chinese black vinegar and Chinese mustard adds more taste interest to this thick soup. 3) Protein 1: Roast Duck and Chilled Pigs Feet. 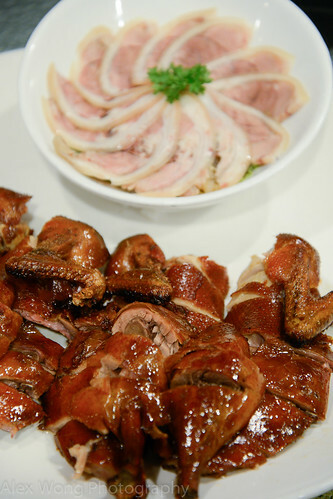 Savory crispy skinned duck was paired with thin slices of deboned and poached pig feet. Again, we see a study of contrast of flavors, textures, and in this case, temperatures. I must say that the pigs feet tasted better than it sounds and I enjoyed its slightly gelatinous quality. 4) Protein 2: Tuna with Green beans and Crispy Tofu Skin. Pieces of tuna have been broiled with a thin sticky coating most likely made with some Miso paste judging by the color and taste. 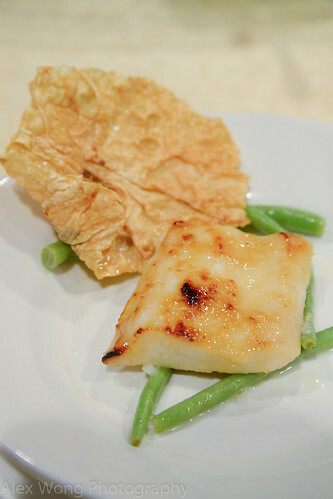 The crispy tofu skin was a good foil against the moist fish, along with the sweet al dente young green beans. 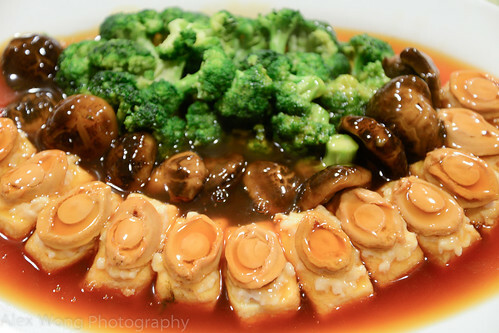 5) Vegetable/Tofu dish: Broccoli, Chinese Mushroom, and Abalone on Tofu. When this dish arrived, we marveled at its presentation as well as the amount of baby abalone, a pricey mollusk rarely served in banquets. These pieces of seafood have the texture of squid but exude a richer seafood flavor, and this rendition was perfectly cooked sitting on pieces of silky tofu stuffed with a flavorful shrimp meat paste – this was heavenly. 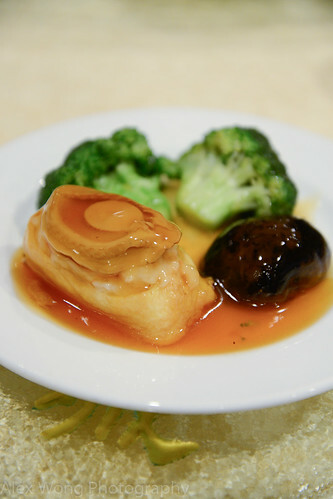 The pieces of broccoli and Chinese mushrooms were equally well-cooked; however, they took a distant secondary role to the marvelous seafood. 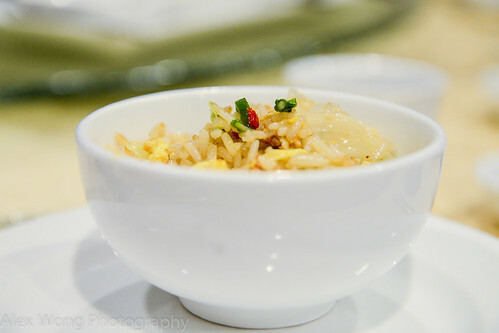 6) Rice/Noodle dish: Fried Rice. At this stage of a banquet, either starch is served. In the hierarchy of grains, rice takes the lower rung. Hence, this dish is a “throwaway” dish, meaning that the diner needs to fill-up with this grain before the last course. This version was well prepared but was not memorable since it was a completely mild dish. Some chefs have “exotified” this humble dish by adding dried baby white bait fish and other non-Chinese seasoning. 7) Dessert: “Malay” Steamed Cake & Longan, White Fungus, and Sea Coconut in Syrup. 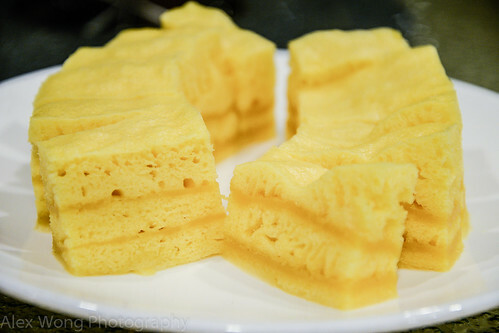 This moist steamed sponge cake is perhaps a Chinese creation a la Malay with layers interspersed with a layer of caramel, giving the cake a sweet interest. 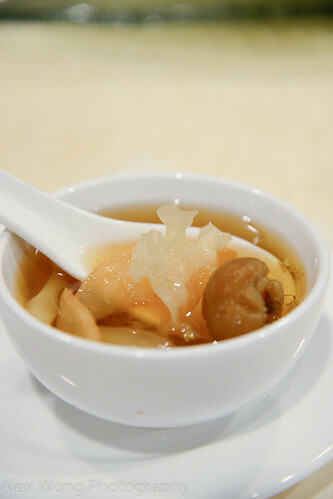 The side of sweet chilled soup was not too sweet with bits of slightly firm sea coconut, slightly bouncy white fungus, and fleshy longan fruit. 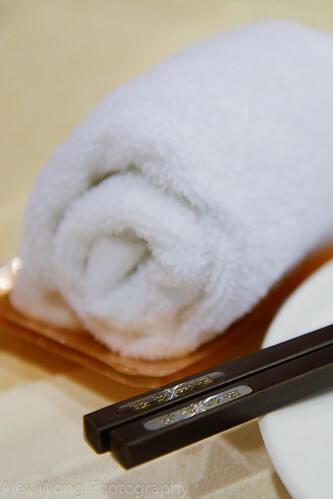 This blog ends the series on Chinese Meals and Banquets. I hope this gives one an idea of how the dishes are ordered in such meals in a logical fashion. Furthermore, I hope that the series has inspired the reader to look forward to partake in such a gastronomic delight when the opportunity arises. I wish these opportunities presented themselves to me monthly, but alas, such is life for this epicurean!